Nexeon HD Xtra is a full-featured video frame grabber for high-definition video display and capture. It supports viewing and capture from high-definition video inputs from SDI, HDTV and VGA display sources. Nexeon HD Xtra has a flexible input interface complete with an HDMI compatible receiver and supports both analog and digital DVI/HDMI standards. Nexeon HD Xtra's high speed bus-mastering capability with scatter gather support delivers realtime video data to system or display memory simultaneously, without intervention from the host CPU. Video data formatting and resolution is independent between streams, allowing for maximum bandwidth flexibility. By incorporating a TI DM642 video processor, Nexeon HD Xtra enables maximum flexibility in handling challenging application requirements. 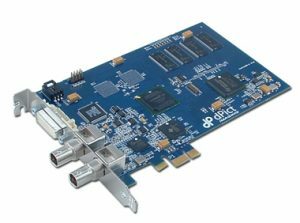 Equipped with a 64 MB SDRAM frame buffer, the video processor provides video scaling, pixel formatting, interrupt support, hardware overlay, and real-time video processing without host CPU assistance. Nexeon HD Xtra supports viewing and capture of the enhanced video quality from SDI sources. SDI is a broadcast quality video transmission standard that allows for the transmission of un-compressed digital video data on a common coax cable at distances up to 300 feet. Nexeon HD Xtra supports the new 3G-SDI standard, allowing digital video data rates up to 2.97 Gb/sec. Nexeon HD Xtra supports capture and steaming of high-definition video and display. Nexeon HD Xtra supports VGA display resolutions up to 1280x1024 at 75 Hz, as well as HDTV inputs up to 1080p. With acquisition rates up to 150 MHz, Nexeon HD Xtra is one of the most versatile frame grabbers on the market.